Can You Eat Dandelion Flowers? When Can Babies Have Rhubarb? Babies younger than 4 to 6 months do not need and should not have any type of solid food, MayoClinic.com states. Rhubarb, a vegetable, contains high amounts of oxalic acid, which can be toxic in high doses. The leaves contain the highest amount of oxalic acid and should not be eaten; the stalks contain less, but certain growing conditions can affect the plant, causing the oxalic acid content in the stalks to increase to dangerous levels. If rhubarb undergoes a hard freeze, some of the oxalic acid might move from the leaves into the stalk, Iowa State University Food Safety News reported in April 2007. If this happens, do not feed your baby or anyone else the rhubarb stalks. If you don't know if the plant has undergone a hard freeze, don't serve the stalks to your baby. Never give your baby the rhubarb leaves, which contain the highest amount of oxalic acid. In very high doses, eating rhubarb leaves could be fatal. 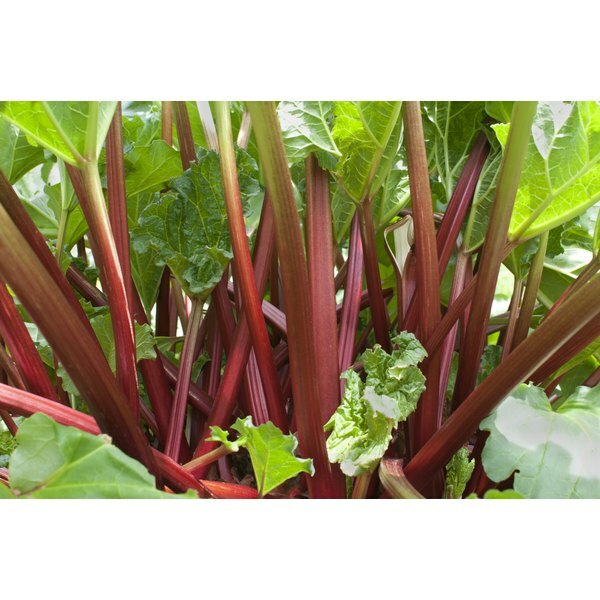 The stems and roots of rhubarb contain anthraquinones, laxative substances that can cause diarrhea. If you feed rhubarb to your baby, watch for signs of loose stools. Severe diarrhea can cause dehydration in infants. Oxalic acid could also bind to calcium and reduce calcium absorption, although this seems unlikely, according to NYU Langone Medical Center. The oxalic acid in rhubarb could increase the risk of developing kidney stones. Rhubarb is low in calories and fiber, despite its stringiness, according to the University of Illinois Extension. Rhubarb also has a bitter taste that your baby might not appreciate. You would probably need to add sugar to rhubarb to make it palatable for a baby -- or anyone else. Sugar supplies empty calories that add nothing to an infant's nutrition. Rhubarb could have serious side effects under certain conditions. As long as you take safety precautions, your baby can eat rhubarb once he starts eating solid foods, if you can get him to eat it without adding a lot of sugar. Because of the bitter taste, you might prefer to serve other foods to get your baby used to eating solid foods before giving rhubarb. When Does a Fever Become Dangerous for a Baby? What Is Fucus Vesiculosus Extract?